As Laura’s breast-feeding journey came to end with her child, she experienced pain in her left breast. After a mammogram, she was told it was calcification in her milk duct and the pain should go away. The pain continued. After a second mammogram she was told to purchase new bras. With the blue-ribbon of brassieres holding her bosom, Laura still had pain. A third mammogram showed that the calcification grew. During the biopsy, the surgeon assured her that it was most likely nothing. Post biopsy and as she was driving, she received the call. She had Invasive Ductal Carcinoma and a plan needed to be made right away. That plan included a mastectomy of her left breast, removal of eight lymph nodes, drainage tubes, a plethora of pain pills and reconstructive surgery all on the same day. On October 18, 2013 Laura completed her treatment and was cancer-free. A Komen funded study at the IU Simon Cancer Center allowed Laura to avoid chemotherapy as part of her treatment. The Oncotype DX test, which costs around $4,000, helps patients make informed decisions about if chemotherapy is right for them. Laura’s insurance company would not pay for the testing due to the size of her tumor. She was .1 cm below the required size to deem the testing medically necessary. 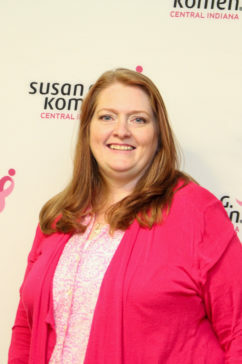 Laura received the test free of charge through IU Simon Cancer Center because of funding from Susan G. Komen. Laura has formed a team for Race for the Cure every year since April 2014. Her goal every year is to raise enough money to provide another individual access to the Oncotype test.